The corticospinal tract is a descending motor pathway originating in the Primary Motor Cortex (Brodmann’s area 4) and terminating at various levels in the ventral horn of the spinal cord. The corticospinal tract descends through the posterior limb of the internal capsule then down through the cerebral peduncles into the brainstem. 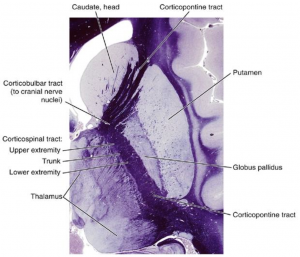 In the brainstem the corticospinal tract remains in the ventral portion, passing through the pyramids on its way down. In the caudal brainstem (just above where the spinal cord starts) 90% of the the corticospinal tract decussates (crosses) to the contralateral (opposite) side and continues down through the dorsolateral spinal cord. This portion controls limb movements. The remaining 10% remains in the ventral spinal cord and is largely responsible for bilateral axial (trunk) movement. From the dorsolateral spinal cord, the axon (that started in the cortex) enters the ventral horn of the spinal cord at the appropriate level (e.g., cervical for arms or lumbar for legs) then exits through the ventral root to terminate on the appropriate muscles. Through this tract, the cortex controls much of the movement of the body; as such, it’s vitally important for our functioning. Damage to the tract results in an upper motor neuron disorder, with paresis (weakness instead of complete paralysis) and the Babinski reflex fairly common symptoms. Soon after damage, a patient might have flaccid paralysis though with little to no movement of the affected limb(s). As the body starts to recover slightly, spastic paralysis usually sets in with jerky, often uncontrolled limb movements. The corticospinal tract is one of the largest pathways in the central nervous system; it’s one of the most important for motor functioning as well.